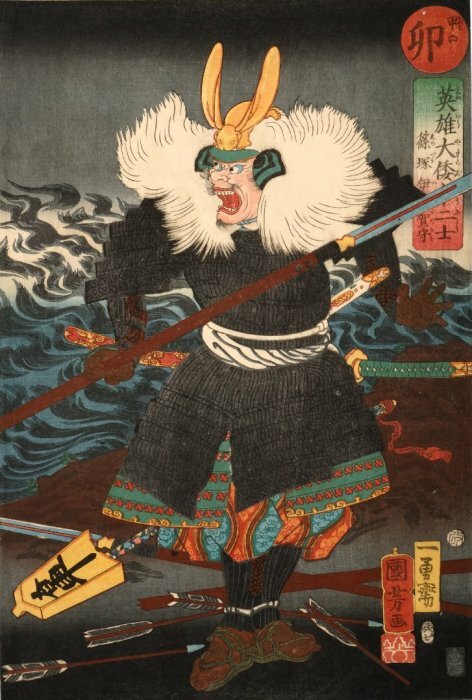 The Samurai Archives Citadel // View topic - translation request..
Posted: Fri Jun 27, 2008 4:25 am Post subject: translation request..
Can anyone translate the writing on the right hand side of this Kuniyoshi print? my birth year is the year of the snake and apparently this is from a series Kuniyoshi did for "Japanese Heroes for the Twelve Signs"
Posted: Sat Jun 28, 2008 8:16 am Post subject: Re: translation request..
EGARA no Heita Tanenaga 荏柄平太胤長 is supposed to be WADA no Heita Tanenaga 和田平太胤長. WADA Tanenaga's mansion was situated in the residential district near Egara Tenjin Shrine 荏柄天神社, north-eastwards shôgunal palace (in Kamakura, of course ! ).